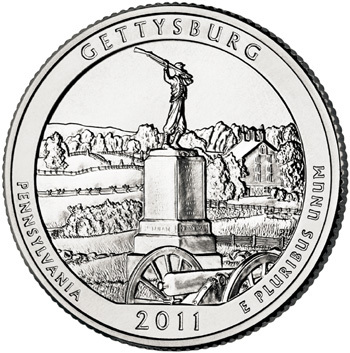 As the sixth coin in the ongoing America the Beautiful Quarters series, the Gettysburg National Military Park Quarter will be released on January 24, 2011. The park was chosen to represent the state of Pennsylvania for the series. The reverse design portrays the 72nd Pennsylvania Infantry Monument, located at the battle line of the Union Army at Cemetery Ridge. This was chosen over three other designs which also portrayed monuments within the park. Inscriptions include “Gettysburg”, “Pennsylvania”, “E Pluribus Unum”, and “2011”. The reverse was designed by Joel Iskowitz and sculpted by Phebe Hemphill. The obverse of the coin will feature a portrait of George Washington by John Flanagan. For the present series, the details of the original model have been restored. Gettysburg National Military Park Quarters will be issued for general circulation, as well as sold by the United States Mint in different numismatic products. Proof version of the coin should be available for sale within annual sets issued January 2011, with other products released at later dates.